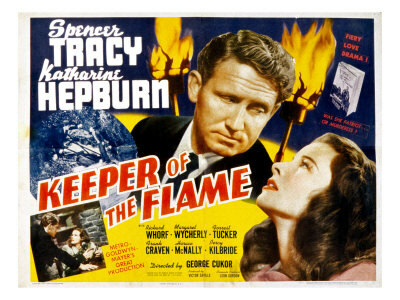 I just caught a showing of George Cukor’s 1942 Keeper of the Flame, a somewhat unconventional vehicle for Hollywood stars Spencer Tracy and Katharine Hepburn. Keeper Of The Flame never really makes Forrest an exact copy of Lindbergh. After all, the “Lone Eagle” was still alive in 1942, and capable of suing MGM. . . . But the unpleasant experience of Lindbergh’s American First crusade, culminating in his notorious “Des Moines” speech where he hinted at Jewish influence to push the U.S. into war, was sufficient to make the character of Forrest stand for only one other American. It seems to me a little thin: there really is very little about the character or his family or the few details about his wartime heroics that suggests anything but the slightest resemblance to Lindbergh. To me, the movie reflects a rather more generalized (and, by late 1942, somewhat outdated) fear of the presence of a “Fifth Column” of secret traitors in the government, and a skepticism about heroes that was becoming more and more widespread in American culture. This entry was posted in Charles A. Lindbergh, Movies, popular culture and tagged Lindbergh, movies, popular culture by jbrianh. Bookmark the permalink.